Like you, I'm an enthusiast. I love keyboards, synthesizers, recorders, effects, and anything else that allows me to impose my musical ideas on anyone careless enough to listen. Since the early 1970s, I've wanted every piece of equipment I've owned or played to sound great and do everything that it promised... and more. Sometimes I've been happy, other times frustrated, and it pains me when something fails to live up to expectations. Furthermore, I take no delight in expressing that dissatisfaction, particularly when I know that the people involved have tried hard to develop a good product and market it at a competitive price. So when I reviewed Arturia's Minimoog V (or MMV) earlier this year, I really wanted it to be superb. Unfortunately, a number of serious problems presented themselves, so I described these as fairly as possible, and thought that was that. It's simple to obtain v1.5 — you just click on a link at the above-mentioned page on Arturia's site. Once you've downloaded and run the installer, you will be prompted for the original CD, and once you've inserted this (a sensible anti-piracy precaution), the new version will appear soon after. When testing the sounds of the oscillators in v1.1, I found that the square wave sounded much 'hollower' than on my Minimoog. This was because Arturia's wave was too close to the ideal; real Minimoogs produce non-ideal square waves with duty cycles that are not exactly 50 percent. 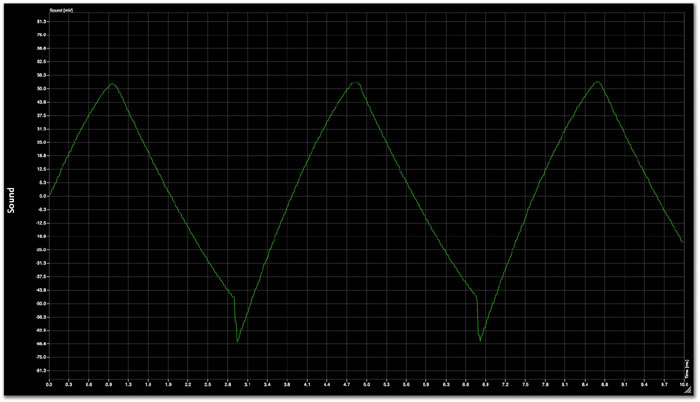 In MMV v1.5, the square wave has been modified, and its default duty cycle is now 48 percent. The result is that the sound is amazingly close to that of my Minimoog, from the bottom of the keyboard at 32' to the top at 2'. Nonetheless, if you want perfect square waves, you can have them. As I noted in March, Minimoog V allows you to adjust the duty cycles of its pulse waves, so the choice is yours. A more significant problem in v1.1 lay with the ramp+triangle wave, which was very different from that of the Minimoog itself. The improvement in v1.5 is clear to hear and to see — see the three graphs below. The first of these shows the ramp+triangle from my Minimoog, while the second shows the same wave produced by Minimoog V version 1.1, as reviewed in March. The third graph is the same wave from the updated MMV v1.5, and as you can see, it's all but identical to the real thing. Sonically, the improvement is remarkable. The ramp+triangle from the author's Minimoog. Here's the same wave produced by Minimoog V version 1.1. This third graph is the same wave from the updated MMV v1.5, and as you can see, it's all but identical to the real thing (top). 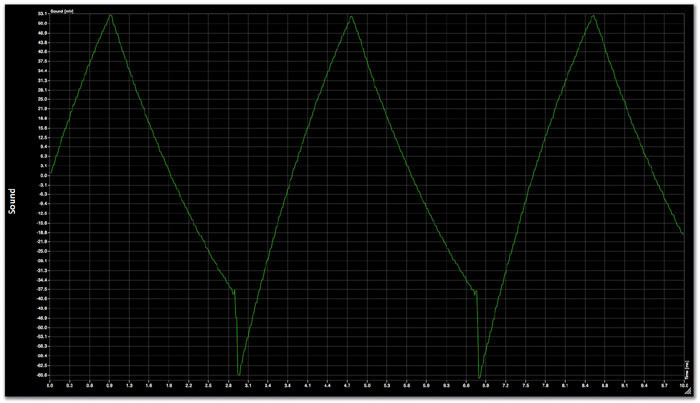 A lesser error lay in the triangle wave, which was significantly 'woodier' than on my Minimoog. Again, a direct comparison with my Minimoog shows that Arturia have sorted this out in v1.5, and it would be a braver man than I who would now claim to be able to distinguish the software synth from the lump of wood and metal. In addition, the ramp wave settings now produce ramp waves, and the sawtooth wave settings now produce sawtooth waves (on version 1.1, the polarities were swapped). In short, this is all excellent. While I am happy that Minimoog V 's oscillators are now a remarkable recreation of the Minimoog's, the same is not quite true of the mixer. As before, this exhibits a strange effect whereby, if you switch oscillators off and on again, their relative phases jump instantaneously to new values, thus changing the tone of multi-oscillator sounds considerably. However, in a marked improvement over v1.1, the new version exhibits a slight drift so that multi-oscillator timbres change gently over time. This is as it should be. Another important area in which earlier versions of Minimoog V fell short of the Minimoog's distinctive character was in the nature of the filter; both in its response to Emphasis, and in the way that it reacted to its dedicated contour generator. The good news is that v1.5 is much closer to the original. 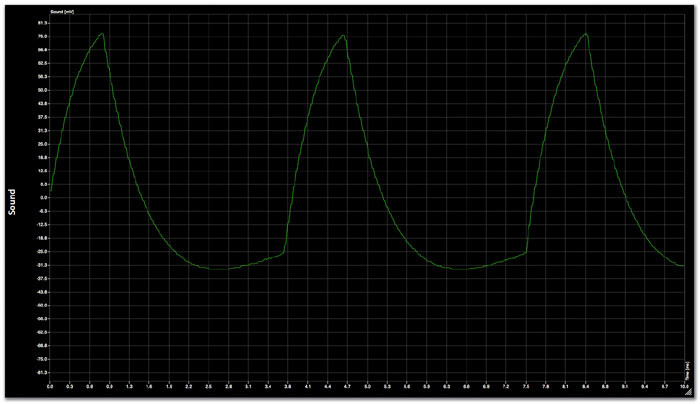 Firstly, its maximum cutoff frequency, while not in the supersonic range of my Minimoog, is now up from 18.6kHz to 19.8kHz, which is a small but welcome improvement. Secondly — and far more significant — the Emphasis is much improved and, as on the Minimoog itself, this now decreases as the cutoff frequency drops lower and lower into the bass frequencies. What's more, the amplitude of the self-oscillation obtained with maximum Emphasis is much more realistic, starting at zero amplitude in the deep bass, and rising with increasing frequency. The point at which self-oscillation begins is not the same as on my particular Minimoog (it's about an octave lower) but I'm happy to accept that it now lies in the range of responses that one would obtain from a selection of real Minimoogs. The next improvement relates to the 'climbing' VCF/VCA contour that I drew and explained in my original review in March, and which I've reproduced here as the graph on the right. Version 1.5 of MMV now generates this, although the response is still not quite right. 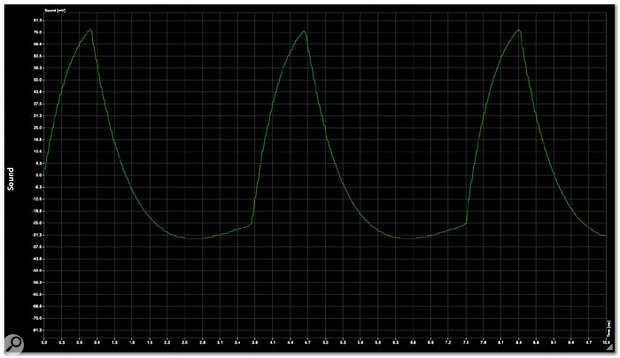 To be precise, the 'climbing' effect in version 1.5 of MMV is only obtained when both the filter and amplitude contours have non-zero Decay times. This is not correct; you should be able to open the filter by playing quickly even when the amplifier contour is 'square'. Nevertheless, Arturia's amplifier and filter now respond in ways that — for many patches — let you play Minimoog V as you would an original Minimoog. 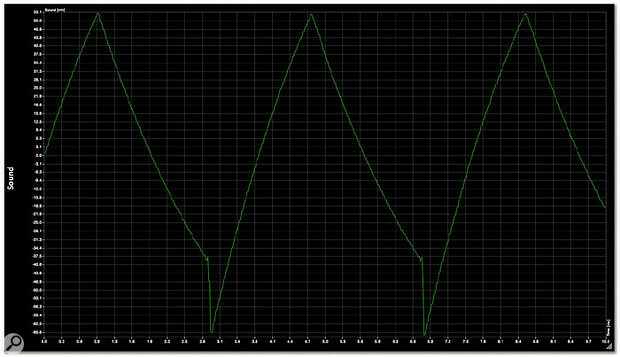 While on the subject of the contours, an instantaneous Attack/Decay envelope still does not produce the characteristic click of a Minimoog when all five audio sources are off, but the envelopes thus generated are now even faster than in v1.1, with an Attack/Decay duration in the region of two milliseconds. This is remarkably rapid. I don't think I've ever measured an analogue synth with a response that fast, so Minimoog V now sounds very snappy indeed! In my review of v1.1, I pointed out two further errors that plagued earlier versions of MMV. The first concerned a strange method of emulating oscillator drift, in which the relative phases of the oscillators, and therefore the timbre of the sound, would jump after every handful of notes played. This error has been eliminated in v1.5, and you can hear (and see on an oscilloscope) that the oscillator drift is now gentle and free running, as it should be. At the same time, Arturia have also tweaked the Unison mode, adding some inter-oscillator drifts to produce what they call 'a fatter and larger sound'. To my ears there is more detuning and drifting going on than before, so I found myself reducing the values of appropriate parameters to bring my patches back to where they were in v1.1. 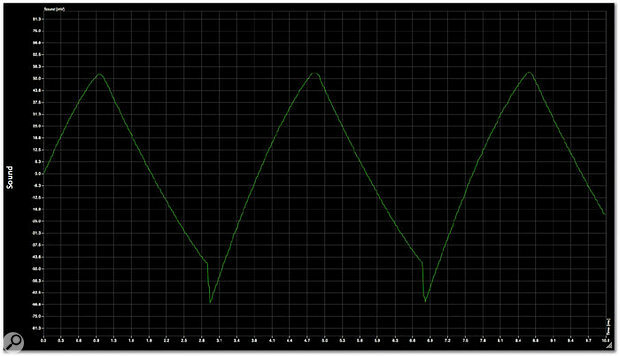 The VCF and VCA contour generated by a Minimoog played rapidly. The other error in MMV v1.1 was the generation of random clicks when the envelopes were set to be as near instantaneous as possible. These clicks appear to have been eliminated. The same is true of the digital overloads that I experienced in v1.1. Other than when I created polyphonic patches that demanded too much processing power (which, to be honest, wasn't hard on a 1GHz Powerbook), or when I reduced the latency too far, no glitches occurred. Inevitably, there are a handful of issues that Arturia have not addressed in this release. For example, the response of the pitch-bend wheel still lags the physical movement of an external wheel by a noticeable amount, slewing to the final point of travel rather than following the wheel movement. That's one for v1.6, chaps... And likewise, the soft clipping is still not right. Invoking this increases the peak-to-peak voltage (and, therefore, the level) of the output by about 10 percent. Staying with clipping for a moment, Arturia claim in their v1.5 release notes that the CPU demands exerted by the soft-clipping feature have been reduced. To test this, I set up a polyphonic sound that generated a digital overload consistently on the eighth note. I then switched on clipping, and the overload occurred on the third note. This means that invoking soft clipping trebled the amount of processing power required. Clearly, this is still a feature to be used with great care! Other issues remaining to be addressed include the audio rate FM of Oscillator 1 by Osc 3, which still isn't quite the same as on my Minimoog. Most obviously, the maximum modulation depth is much lower on Minimoog V and, although I'm not overly concerned by this, it would be nice to see whether this could be improved. Finally, I note that Minimoog V still suffers from parameter stepping, although this is only really discernible if you hunt for it, perhaps by adjusting the cutoff frequency knob when the filter is self-oscillating. I'm confident that this could be reduced or even eliminated by parameter interpolation (as it is on some virtual-analogue keyboards) so I hope that Arturia will address this. Downloading MMV version 1.5 is not for the faint-hearted using 56K dial-up connections. The update for Windows is 17.1MB in size, whilst that for Mac OS 9 is a modem-busting 40.6MB. The OS X updater is only slightly slimmer and trimmer at 40.1MB. In March, I made the point that although MMV looked like a Minimoog on screen, it didn't really sound like one. Today, it sounds and responds like the hardware original. In fact, it's now a remarkable imitation that I would happily use and be confident that you would never realise that it was not the 'real thing'. Secondly, Minimoog V remains a superb polysynth that exhibits great depth and character. OK... it's still hungry for processing power, so it's not ideal for people with older computers. Indeed, I think that overloading a 1GHz Mac G4 processor with just three notes is some achievement, but Arturia are hardly alone in this, and judging by its suggested minimum specification, Gmedia's forthcoming Minimonsta emulation threatens to be even hungrier, so maybe I should not labour the point. In conclusion, I can only commend Arturia for responding so quickly and positively to the criticisms of earlier versions of Minimoog V. The reaction of many manufacturers would have been to defend their product to the death. In contrast, Arturia have corrected all the major problems and undertaken to look at the issues that remain. As a result, MMV is now an excellent emulation of the Minimoog, and the improvements have been achieved without sacrificing any of the good things in earlier versions. The oscillator waveforms are now extremely authentic. The filter response is now much more authentic. The envelope response is extremely fast, and more authentic than before. The oscillator 'drift' mechanism no longer produces abrupt changes of timbre. Or rather... it's a Polyminimoog! 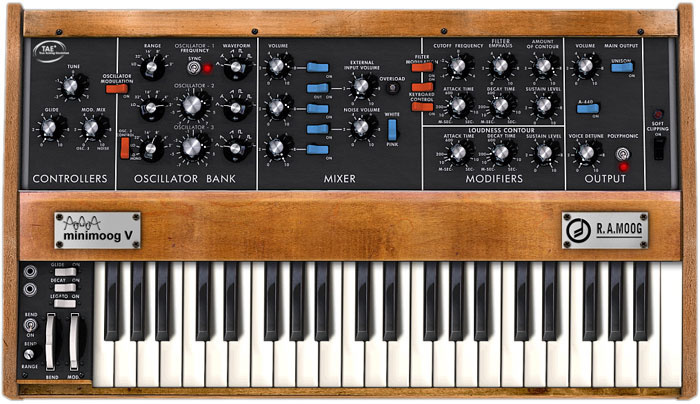 Version 1.5 of Minimoog V not only looks like a Minimoog, it now emulates one. It's also an excellent, although power-hungry, polysynth in its own right. If you liked version 1.1, you're going to love this. If you were deferring a decision until the bugs were ironed out, you can now stop waiting. The Arturia Minimoog V v1.5 upgrade is free of charge; v1.5 when bought new is £149.99 including VAT.